In the spirit of Valentine's Day and the latest MacTweets challenge, I decided to attempt heart-shaped macarons. It's very tricky to do since the shells spread as soon you pipe them out. You have to do a kind of V-formation. Unfortunately, mine ended up looking more like Vs than hearts! I used my same macaron recipe that I love (Lebovitz is the best! ), but swapped out a tablespoon of cocoa powder for cinnamon. I thought I loved cinnamon but it definitely didn't need that much. Oddly enough, that was my first time baking with cinnamon... It turned out... interesting. I think cinnamon sounds much more delicious to me than I actually find it to be. My niece gobbled them up, and even J enjoyed them, since they weren't sweet whatsoever. I filled them with a simple chocolate ganache that is my favorite to make (heavy cream + chocolate = heaven). I had originally made a white chocolate filling so it would look prettier with pink and white colors, but it tasted funny to me, so I changed it to dark. I'm glad I got some practice making heart-shapes since I think I might attempt some tomorrow for the coconut ones I'm going to try... It definitely takes some time making the exact same ones so that they sandwich together well. I do like this recipe overall, although I'd put it in only a teaspoon of cinnamon next time. Cinnamon's a pretty potent spice. I don't know how big these batches are but a teaspoon probably would be enough, if not still too much. Oooh just lovely! I tried heart shapes and failed miserably. Yours are perfect! I'd so love to watch you piping them. And cinnamon macs with dark chocolate ganache is indeed heaven! So glad you joined us for Mactweets Mac Attack and made these beautiful macs! 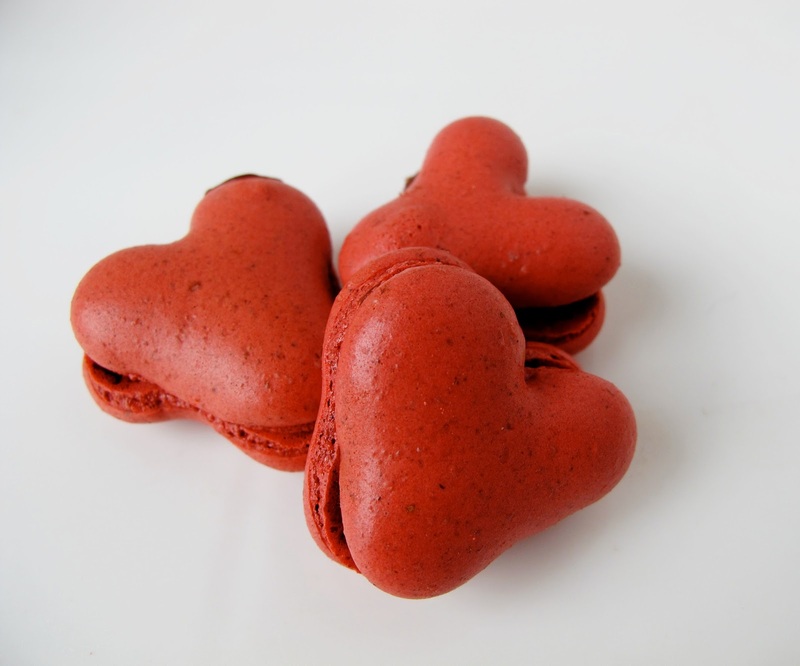 Those are the most gorgeous full throated red macarons I have seen.I love the Levobitz chocolae macarons recipe too, and I think your combination spells true love! I can barely get my round macs to grow feet... HEARTS with FEET? You've raised the bar really high Amrita. Thanks for joining us a MacTweets! Your little mac hearts turned out beautiful and the cinnamon flavor with dark chocolate ganache filling sounds yummy! Nicely done! I am so impressed by the beautiful defined heart shape you were able to get with your macs. Awesome job! Wishing you a fabulous valentines day. Heart shaped macs!! They are beautiful. Love the color and flavors. I have never seen a non-circular macaron, and I must say they are perfectly wonderful! Would love to get a bag of those from someone someday. Perfect Chewy Golden Chocolate Chip Cookies!